Scrumpy & Western website. Made In Somerset from cider! The Mangledwurzels band page. Trevor Crozier was one of those multi-talented and fascinating people with seemingly endless interests that he is almost impossible to categorise. 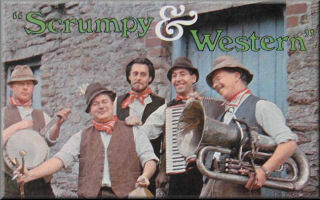 However, his influence on Scrumpy & Western music is undeniable. The fact that he co-wrote one of Scrumpy & Western's greatest classic songs Don't Tell I, Tell 'Ee would be enough justification alone for including him in these pages. However, his involvement in Scrumpy & Western didn't end there. He recorded a few records which have become classics in the genre and are now much sought after by collectors - see below for further details. But this was just one of his musical interests - he was also at various times during his career involved in such diverse music as skiffle, jug-band music, trad jazz, medieval music and many types of folk music including Irish, English and Breton. Over the years he built up a considerable reputation as a multi-instrumentalist, songwriter, singer and entertainer as he performed at pubs, clubs and folk festivals. Perhaps his diversity of interests owed something to his much-travelled youth - born in Southampton, he spent time living in various parts of Africa. Cornwall and Devon, France, London and Ireland (and probably other places). 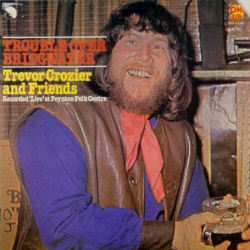 Trevor was a member of the legendary House Of David Jug Band while at Trinity College Dublin in the 1960s - he was a contemporary there of that other songwriter with Scrumpy & Western connections, Ian Whitcomb. After leaving university he formed the equally legendary Broken Consort, immortalised for their strange amalgam of medieval and Scrumpy & Western music. When Broken Consort lived up to their name and split up, Trevor (who was then living in Brittany, France) formed the Celtic folk group Lyonesse. But back to Trevor's Scrumpy & Western credentials! As well as writing arguably one of the greatest songs in the Scrumpy & Western canon Don't Tell I, Tell 'Ee, he penned a nuber of other songs recorded Scrumpy & Western artists including The Piddletrenthide Jug Band (recorded by The Yetties, and retitled as The Charlton Mackerel Jug Band and recorded by Adge Cutler & The Wurzels), Dorset Is Beautiful (recorded by The Wurzels and The Yetties), The Verger (recorded by The Wurzels) and the classic he recorded himself Dead Dog Scrumpy. Not content with staying in music, Trevor was spotted in a TV documentary having branched out into - of all things - the growing and marketing of loofahs in Africa! Sadly, this true eccentric and unique entertainer met an untimely death in a motorcycle accident in Malawi in 1995. As long as scrumpy drinkers gather together to sing Don't Tell I, Tell 'Ee, he will live on, like Adge Cutler before him, in song. Just ask fer Dead Dog Scrumpy - it's the best there is by far. You can always recognise it by the hair of the dog!" This 24 track album is a tribite to the man’s memory and contributors number friends and admirers who have kindly donated tracks. Maddy Prior, Mike Harding, Lea Nicholson and Naomi Randall, John The Fish, Liz Dyer, The Druids, Vic Gammon (who was part of Trevor’s band Broken Consort), Paul James of Blowzabella, Shelley Rainey and Benny Graham are all here as well as the aforementioned Joe Beard and Gerry Robinson (both from the original Purple Gang). Epona MC Mike Billington also makes a few appearances. Cyril Tawney's 1969 album Children's Songs From Devon and Cornwall 1969 features Cyril on voice, Tom Paley on guitar and Trevor Crozier on Jew's harp, mandolin and concertina. Kevin Goodall for information about some of Trevor's records. Alistair Banfield for his help with further information.